Lebanon’s IPRI score increased by 0.010 to 4.342 placing it 13th in the Middle East and North Africa region and 108th in the world. Lebanon is classified by the IMF as part of the Middle East, North Africa, and Pakistan group and by the World Bank as Upper middle income country. Lebanon’s Legal and Political Subindex increased by 0.066 to 3.028 with scores of 3.421 in Judicial Independence, 3.282 in Rule of Law, 2.340 in Political Stability, and 3.067 in Control of Corruption. Lebanon’s Physical Property Rights Subindex decreased by -0.04 to 6.624 with scores of 5.302 in perception of Property Rights Protection, 8.848 in Registering Property, and 5.722 in Ease of Access to Loans. 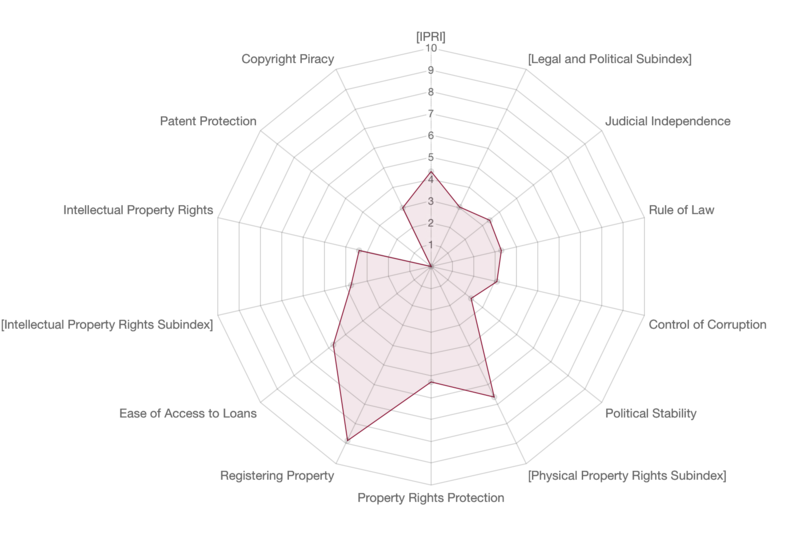 Lebanon’s Intellectual Property Rights Subindex increased by 0.008 to 3.373 with scores of 3.747 in perception of Intellectual Property Protection, data wasn't available to measure Patent Protection, and 3 in Copyright Protection.